Fashion-forward men who are all about custom wear and looking sharp, we got good news for you. 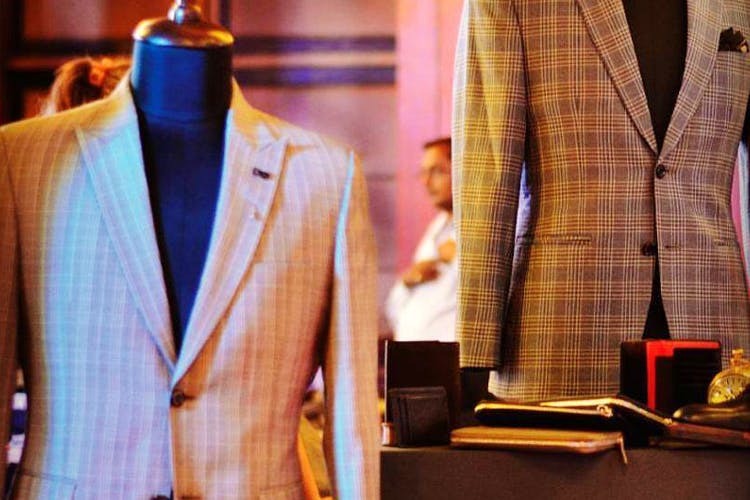 These tailors and studios in Koramangala are all about that impeccable fit. Be sure to bookmark this recommendation so that the next time you are looking for a shirt to match a three-piece suit, you know where to head to. Oh, and on the price point, the stitching charges start at INR 1,200. If you are not getting that exact fit from run-of-the-mill stores or prefer wearing custom shirts, The Shirt Studio is where you need to head to. There’s an extensive collection of pre-made designs for you to choose from along with customisable collars, cuffs, fit, placket, and pleat that can be customised according to your preference. Get yourself everything from factory stitched shirts, trousers and Nehru jackets to suits, blazers, and vest coats. Essentially a fabric store, they stock up on yards and yards of fabric from Raymond and Reid & Taylor as well as local brands. They undertake tailoring orders for suits, trousers, suits, and blazers and are really old school when it comes to designs. They do ensure that you get the perfect fit, but don’t go expecting a wardrobe out of Suits but more of Michael Douglas’ wardrobe in Wall Street or the wardrobes of the cast in Tinker Tailor Soldier Spy. Shirts and trousers are more modern in design, so you can customise your cuffs, collars, and pleats. Gentlemen, meet the makers of the perfect suit. Designer suits, wedding suits, and business suits are what P.N. Rao is all about. We are not going to say that these guys are expensive, but hey, you and we know that a good three-piece suit is an investment, so be ready to spend a bit. Even if you are not planning on going all out, you can still get a blazer or suit custom made by these folks. They even have a Tailor On Call service, where you can book an appointment with their in-house tailor who will come home or office at a time fixed by you. The wedding suits range from the simple to the grandiose and very much Bollywood inspired. The business suits take the more refined and sharp approach when it comes to designs. Remember Don Draper? The in-house team will help you out from choosing what kind of fabric (wool, Irish linens, pure cotton, silk and polynosic) to what colours work best for you. You can either select from their design catalogue or head there with a design idea in mind or paper and consider the job done.